These two short collections from Mexico resonate with very different imagery and yet both are readily accessible to what might be termed a ‘non-Mexican’ sensibility. Ingrid Valencia’s Circle in a Different Sun throbs with the insistent beat of the city, the heat in some of the lines almost too much to be borne. The language is of the internal life and not a comfortable one at that but nonetheless, dense and hypnotic. One poem, ‘I didn’t always come to the appointment’, stopped me in my tracks and I think it will stay with me for a long time – as taut and clear a description of self-avoidance as one might ever read. With each line, you feel drawn into the pain of someone else’s existence, but it is a hopeful pain. I found myself rooting for her, willing the moments of relief to expand beyond the lines that bound them. The final exhortation in the final poem is "Oscúrame”, expanded by Cellini’s translation from its literal meaning of “hide me” to include an inference of longed for healing also. I for one, would not begrudge the creative licence here. The language in Born of Water is as moist and visceral as its elemental heart and yet given the ubiquity of water, there is a much stronger sense of place evoked here than in the above collection. There is an according with the flow of life in this language and it breaks over you time and again with a sense of space and optimism. 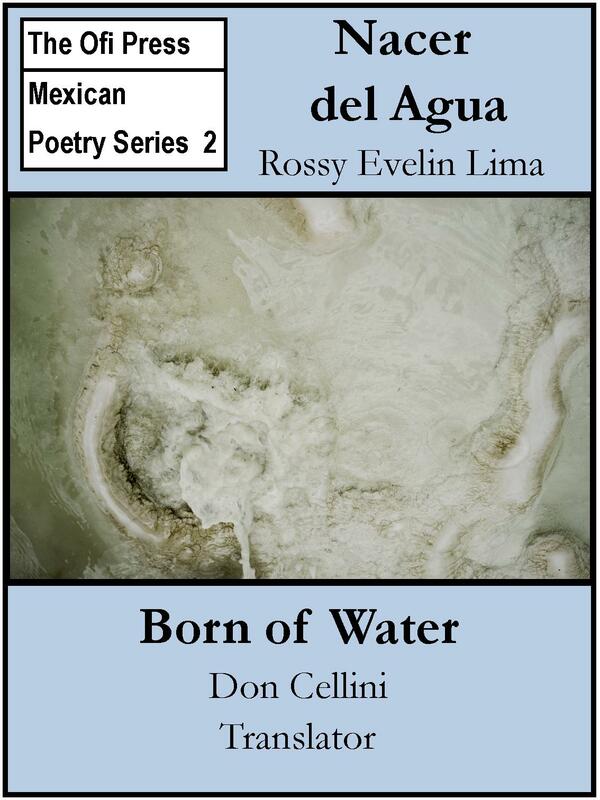 Rossy Evelin Lima brings a sense of light glistening on water to the spaces between her words – although this could be any light and any water, the conjuring of images as in the line “I sleep in her and wake up a four-year-old beside my grandfather lying on the sand, his white sombrero on his face”, from ‘Esperanza’s Waters’, anchors the reader firmly in a warm, Hispanic reality. I loved the musicality of this translation which enhanced every line, making the flow of words easy on the ear when read aloud. It is hard to pick a stand out poem amongst so much richness but ‘Be like water’ is notable for its tone of quiet joy and evocation of hopefulness. I have never been to Mexico, but if I were to ever go, it would be to take one of these volumes with me and sit on a rock by the sea and read it until I remembered that I too am born of water.